A site plan for the Bellmont Promenade development. 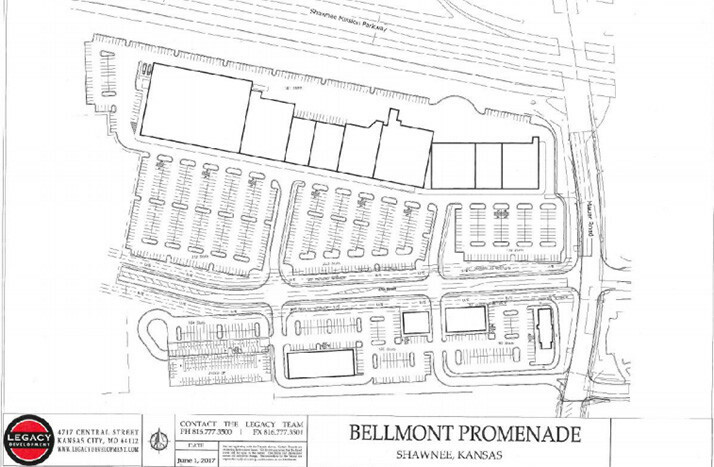 The Shawnee city council approved a nearly $20 million tax incentive package for the development of Bellmont Promenade, a proposed retail and restaurant center for the corner of Shawnee Mission Parkway and Maurer Road, on a 5-3 vote on Monday night. The construction is proposed to span about 26 acres, providing a shopping strip of about 150,000 to 200,000 sq. ft. Construction is set to take place in two phases, with one set to finish in 2018 and and the other in 2019. Project developer Legacy Development has worked on numerous retail centers in the area, including The Legends, Olathe Station and the Oak Park Crossings. Legacy has not disclosed specific tenants it is targeting for the center, but has indicated it hopes to bring specialty and boutique-shops to Bellmont Promenade, providing mostly new stores and restaurants to the community. With Monday’s vote, the $59 million dollar project could receive up to $19.5 million from the city in CID sales tax and tax increment financing proceeds from the site. The entirety of the CID sales tax imposed at the shopping center, as well as 90 percent of the increase in property taxes from the development would go toward funding the tax incentive deal, a tax redirection that could span 20 years if needed. The additional CID sales taxes at the center could be as high as 1.3 percent under the agreement. At least two developers have previously tried to plan for the same plot of land, but found that the site’s tricky topography made development challenging. This time, in addition to significant land grading issues, the Legacy developers have faced disapproval from some community members. Shawnee resident Marlin Cooper spoke at the meeting on behalf of him and his wife, Pat, whose home sits 60 feet away from the development space. The Coopers primary concerns are traffic issues, which would impact to their ability to enter and exit their home, and contamination of their property, which they have lived on for over 30 years, and backyard pond. “We have hired an engineer to come and do an engineer study for this property and they said, and I quote…’a development of this size would destroy our pond,’” Cooper said. Cooper has spoken with Keaton Knott, Chief Development Officer at Legacy Development, regarding the issues, and said Legacy offered to build a traffic circle by their property to address the first issue and agreed work on the pond problem once they receive the plans. Knott said that, prior to receiving council approval, it did not make economic sense for the developers to proceed with a construction design set, which includes the stormwater detention system that concerns the Coopers and their pond. Now that council is cleared, they will proceed with plans and continue communicating with the family. He added that it is required that a storm water inspector and a city inspector are present during construction to ensure all work follows city code. Knott said Legacy feels confident the pond will not be destroyed, and the team will continue to work closely with all neighbors. “There are definitely concerned neighbors in close proximity to the site,” Knott said. “Since [January], we’ve had neighborhood meetings, one-on-one meetings with the Coopers in particular, the Bell road neighbors in particular, really designing around their concerns. While they voiced concerns last evening, I’m confident going forward we’ll continue to work closely with them. Some residents also expressed concern on Monday about the scope of the public incentives plan, questioning whether Shawnee needed more retail with the coming of online shopping, and whether the financial risk to the city and its taxpayers was worth it. Many from the community also presented that the space and money going into Bellmont Promenade could be better utilized to add more senior living to Shawnee. Resident Ken Burning supports the general development, but he does not think it is necessary or right to approve the CID tax to provide the incentive package. The city’s financial adviser, Tom Calico of Springstead Inc., said the financial risks fall on the developer and their equity, their private lenders and the bond-holders. He suggested the city would not be at any significant financial risk, but he did note that the $19.5 in tax incentives would eventually be paid about twice over after factoring in interest. Despite some community member’s reluctance about the project, many members in attendance spoke in support of the proposal and its potential to bring new restaurants and specialty shops as well as more jobs closer to home. Despite the disapproval received, many members in attendance spoke in support of the project and its potential to bring new restaurants and specialty shops as well as more jobs closer to home. “I think we should support people who want to invest $60 million dollars in our city,” resident Justin Nichols said. The city council will continue to meet to discuss specific plans for development. Next articleShawnee Mission school board candidates on the issues: What qualities do you want to see in a new superintendent?